There is no such thing as a perfect television, and there probably won’t be one soon. The LGEG9600 4K UHD OLED TV we review here is no exception to that statement — it has some flaws – but having weighed the criteria, tallied the scores, and put it all into perspective, it is clear to me that LG’s flagship TV deserves the awards and accolades it has been receiving for offering the best picture quality available, despite some rumblings you might stumble on while researching the TV online. I’ve already expressed my adoration for OLED in prior reviews, and gone so far as to give LG’s prior flagship OLED my first-ever perfect score. But times have changed, and LED/LCD TVs have gotten much, much better while remaining much less expensive. Couple such tight competition with the fact that the EG9600 may not be as future-proofed as others on the market and you’d be right to wonder if LG’s latest flagship is worth buying. Let me assure you: it absolutely is. 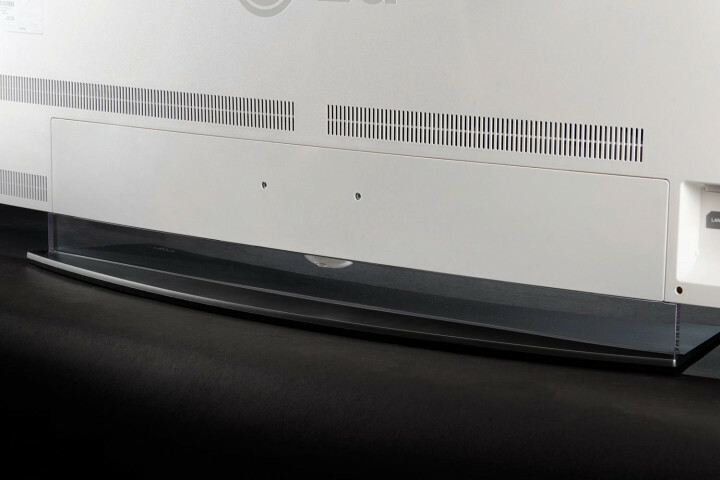 If you’ve got the scratch, the LG EG9600 offers the best overall picture quality available. Time to back that claim up. The LG EG9600, like the EC9300 we reviewed last year, offers the best overall picture quality in a consumer television available today. The reasons are: Perfect black levels, the best off-axis viewing experience, excellent brightness, and outstanding color. No TV display type outside of OLED can produce perfect blacks, nor can they pull off displaying a pinprick of extremely bright light in the middle of the screen without affecting a single pixel around it. LED/LCD TVs fall short here because they rely on backlighting systems and, even though these backlighting systems have seen some incredible improvements in recent years, they still can’t match OLED — the blacks simply aren’t as deep, and there will always be some degree of halo around bright objects on dark backgrounds. Viewing angle is another area where OLED TVs excel. Outside of standing behind the TV, it is nearly impossible to find a viewpoint that has noticeably compromised picture quality elements. Conversely, it seems the LED/LCD TVs that offer the best black levels suffer the most when it comes to viewing angle. We loved the Samsung JS9500, for instance, but its off-axis performance was limited enough that the picture took a big hit once you moved just a few feet off dead center. We don’t know about you, but when we buy an awesome TV, we want to share it with as many people at once as possible. This is an important question, as one of the more exciting aspects of the forthcoming UHD standard is the inclusion of High Dynamic Range (HDR) specifications. HDR, for those unfamiliar, refers to content that’s been captured and programmed to deliver more dynamic contrast information. 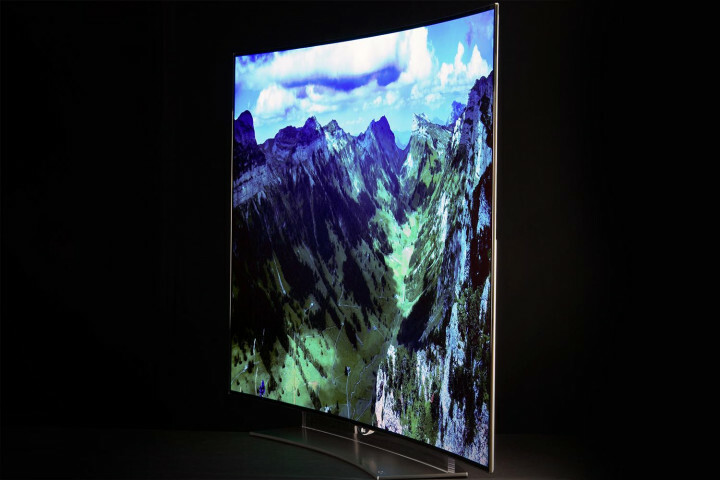 Essentially, it allows a TV to flex its contrast muscle and really take advantage of its capabilities. Here’s the good news: The EG9600 will soon get a firmware update that lets it process HDR material streamed from sites like Netflix, Amazon Instant, and Vudu. The bad news: The EG9600 will never be upgraded to HDMI 2.0a, which means that when Ultra HD Blu-ray comes out later this year, this particular OLED won’t be able to take advantage of everything it can offer. According to LG, the EG9600 is capable of delivering about 92 percent of the DCI/P3 color space, which means it’s about 92 percent as good as digital movie color in a movie theater. That’s in line with the capabilities we’ve seen from competing LED/LCD models outfitted with either quantum dots or special phosphor-coated LED backlights, and closer to the color gamut we see in commercial theaters. Perhaps more important is the fact that the EG9600 is one of the few UHD TVs today outfitted with a 10-bit panel, so it is able to offer finer shades of color and smoother color gradation. That gives you about 1.07 billion colors, and a much more natural-looking picture. WebOS 2.0 is an even more wonderful version of the TV operating system LG launched last year. It offers more customization, faster access to commonly-used functions, and is as intuitive as it gets with its Wii-style navigation. What good is a TV if you don’t like to use it? This is never a concern with LG. Along with that new OS is even more powerful processing. The TV boots up faster, and apps load more quickly. We’ve also found that using Netflix on this TV was a consistently better experience than on some competing brands. Perhaps that’s due in part to the fact that this TV earned Netflix’s endorsement as a “Netflix Recommended” model. I’m surprised to see LG drop an HDMI input off this year’s model. The EC9300 had four HDMI inputs, the EG9600 has three. Why the downgrade? Also, in case you were wondering, the TV’s built-in Wi-Fi adapter maxes out at 802.11n – sorry, no AC this year. If you want to mount this TV, you’ll need to get a specific mount from LG. 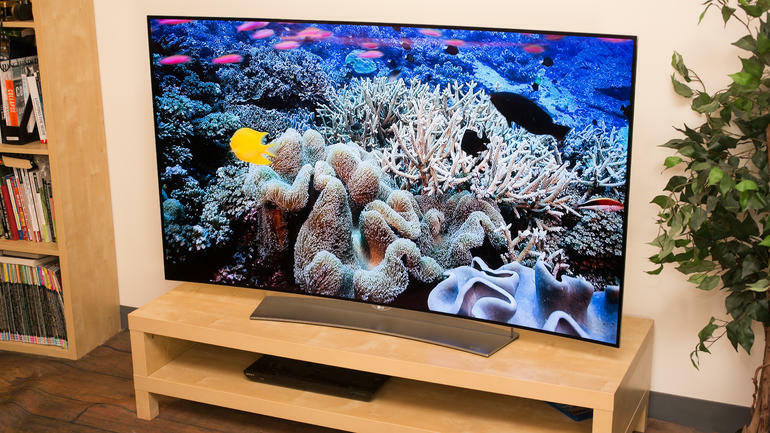 Hey, you’re already spending $7,000 on a TV, so hopefully that $139 mount doesn’t sting too much. So what are these flaws you speak of? The LG EG9600 currently has a slight problem with screen uniformity. I emphasize “slight” here because I think most viewers aren’t likely to notice it, and if they do, they will notice it in limited circumstances. I should add that calling this a screen uniformity problem is tough for me because, while technically accurate, it is much different than the notion of screen uniformity typically applied to a backlit television. You see, when we talk about screen uniformity problems with an LED backlit or edge lit LCD TV, we’re usually referring to hot spots and cold spots peppered across the screen. Generally, areas closer to LED backlights are brighter, while areas further away from the LED tend to be darker. With the LG EG9600, the problem is different. OLED displays have no backlight, and the problem only exists at far left and right edges of the screen, and at very low luminance levels (10 IRE and lower) where the screen would already be very dark. What happens is this: As an image on the screen starts to dim, the edges will get dimmer just slightly before the rest of the screen. Normally this happens so fast it’s hard to catch, but if you use a torture-test scene like some found in dark movies like Prometheus or more recent Harry Potter flicks, and you press pause at just the right time, you can catch the issue in the act. It takes some doing, but if you really work for it, you can catch it. Sound like something that would bug you on a daily basis? It didn’t bother us during casual viewing, and we stare at displays day in and day out. That’s why I feel safe suggesting it probably isn’t going to be a problem for you. There’s another issue that seems related: The LG EG9600 has a tendency to crush extreme low-level blacks down to 0 IRE – or total darkness. Again, this is an issue which rarely rears its head, but it can happen. The result is a subtle loss of shadow detail in dark scenes. However, the benefit is true black. So, if you ask us to decide between not-quite-total-black levels and marginally better shadow details vs. the ability to produce total black and the wider array of color luminance levels available as a result, we’re going to side with the latter. We’ve seen what true black does, and, frankly, we’ll never go back. Finally, I’m still bothered by the EG9600’s tendency to display noticeable flicker when image judder is at play. Judder is a phenomenon that happens when film content recorded at 24 frames per second has to be converted to work on a TV with a 60Hz or 120Hz refresh rate through a process called 3:2 pulldown. All TVs do it to some degree, but the EG9600 tends to call extra attention to the issue because its pixels are super quick to refresh and reach their peak brightness very quickly. However, I did find a way to mitigate the issue by reducing the OLED Light setting from the factory default of 60 (in Movie mode) to 50, then going into the set’s TruMotion setting and cranking the de-blur setting to 10 while reducing the de-judder setting to 0. This calmed the problem down to acceptable levels without causing the “soap opera effect” that it has in the past. That can present a certain challenge. In the course of testing, sometimes we’ll catch something we didn’t expect, and from there it’s easy to get caught up in some sort of witch hunt — as if dubious work is at play and we must root it out and expose the perpetrator. Such has been the case with the LG EG9600. The fact that it has received so much praise and is so expensive makes it an easy target for those who would think that the TV should be without blemish. So when an issue is discovered, it’s easy to latch onto it and obsess over it. But, folks, we’re talking about TVs here. This isn’t some sort of experimental surgical procedure we’re dissecting. People just want to watch movies and TV shows and have them look awesome. It’s really that simple. We can’t ignore anomalies … we have to report on them. But when reporting on them, we can make an extra effort to put them into perspective. And here at Digital Trends, that means looking at things from the perspective of the average consumer. With that in mind, here’s the bottom line: OLED, while not perfect, is a superior display type, and the EG9600 is, overall, the best implementation we’ve seen of it yet. 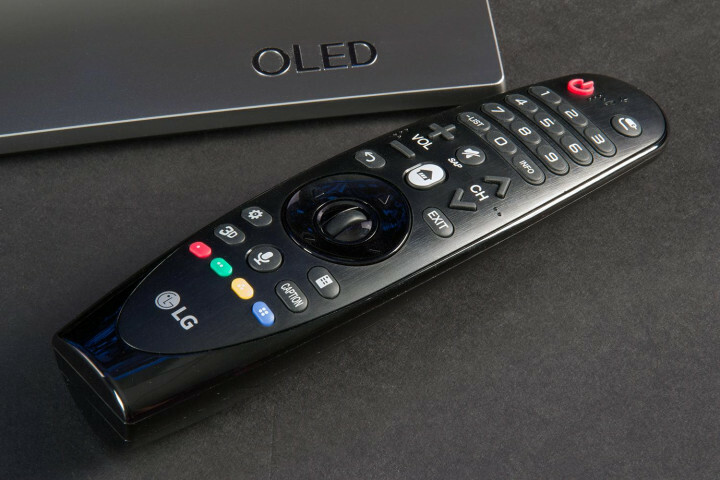 We’re as impressed as anyone with what’s been done to improve LED/LCD TVs in the past couple of years, but LG’s EG9600 continues to prove that, pretty soon, we won’t need LCD TVs anymore. Whether you should buy one depends entirely on where your individual priorities and how much money you want (or have) to spend. This is a really expensive TV that can’t pull off all of the same tricks its competition can – it won’t process HDR metadata via Ultra HD Blu-ray or other HDMI sources, for instance. But if that doesn’t matter to you, rest assured the LG EG9600 makes everything you feed it look glorious – even streaming 1080p content – and you can bet it will be better than the next guy’s TV … unless of course they happen to own the same thing.